Let's get down and derby! 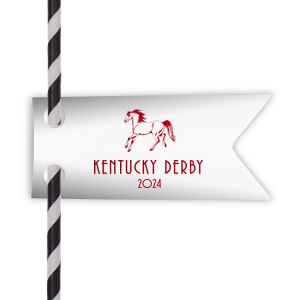 Throw a smashing hit derby party that will have your guests cheering with Kentucky Derby themed party supplies. Creative recipe coasters and styled straw tags are the perfect bar addition to your classic Mint Juleps. Don't stop there! 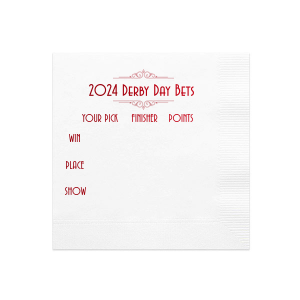 Derby themed party napkins, cups and place cards will look fantastic on your party table and in your guests' hands. Personalize today to create your best watch party for "the most exciting two minutes of sports!" 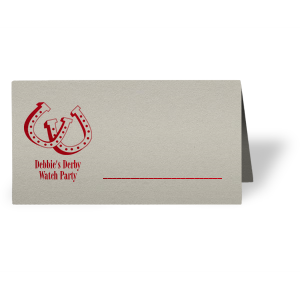 Party planners rejoice, here’s a party theme that has so many iconic details—a Kentucky Derby themed party practically plans itself! 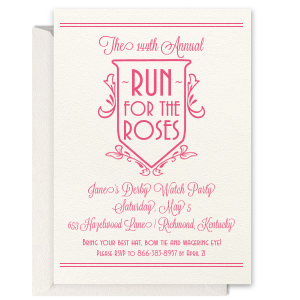 Start with your color palette and establishing the party’s look and feel by taking a note from the Derby itself. Nicknamed the “Run for the Roses” and held at the legendary Churchill Downs, deck out your party with red, pops of green and all the southern charm. You’ll of course want guests to arrive in their derby best, so be sure to include derby hats and bow ties as a dress code in your invitation! Set the tone with a rendition of “My Old Kentucky Home” playing softly in the background as guests arrive. 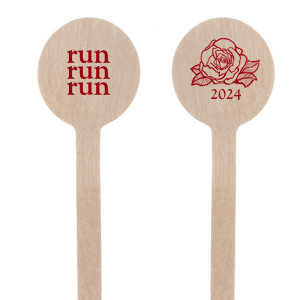 Adorn your party room, porch or garden setting with red roses to help cheer the contestants on to the Winner’s Circle. Cut-out roses and horseshoe banners are also festive Kentucky Derby themed decor that will make fantastic photo ops. The bar wouldn’t be complete without Kentucky bourbon and Mint Juleps! Supply guests with cute recipe coasters so that they can mix up individual cocktails and even bring the coasters home as a derby themed party favor. 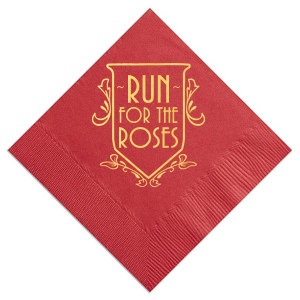 You’ll also want some cocktail napkins personalized with your favorite derby saying for a cute addition that will let your theme shine in every detail. For Kentucky Derby themed food, consider offering southern bites like chicken salad, pimento mac and cheese, pecan pie and Kentucky hot brown sliders. And you, of course, can’t go wrong with fried chicken! Since the derby is outdoors, we do suggest you serve your food in small servings, appetizer style like a picnic at the racetrack.